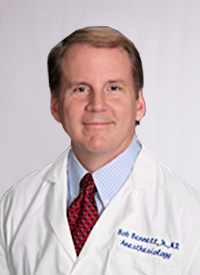 Dr. Bennett has been treating patients in the east Texas area since 1988. After graduating as Class President from the University of Mississippi, School of Medicine, he completed his anesthesiology training at UT Southwestern Parkland Hospital in Dallas. His training included advanced fellowships in regional pain injections in Australia and France. After practicing at our local hospitals for nearly two decades, Dr. Bennett now serves patients at the CareFirst clinics fulltime including performing peripheral and spinal epidural injections for every degree and location of acute and chronic pain.